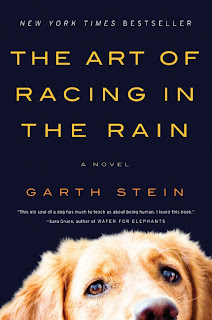 When a friend handed me The Art of Racing in the Rain, my first question was, "Is this going to make me cry?" Her answer was "Well...... not really." Two pages in, I could feel my eyes welling up. But she was right, once I past some initial hard stuff the novel was not going for easy low blows (I'm looking at you Marley & Me.) In fact, I think this book does a great job dodging schmoopy-ness. This novel combines the life of a dog and his family with the story of a race car driver. Dogs - I love. Race cars - I could give a crap about. Still this was inventive and interesting. In fact, the dog is the story's narrator which was an extra point of interest. I read this book in practically one sitting. It's really hard to put down. 6/10. A friend was telling me about this book + she said it took her 2 pages to start crying. I cried through this whole book! And loved it.